← GO GREEN LUNCH BOX – Review & Giveaway! I was recently sent the NEW Quorn Vegan Burgers to try. I was impressed with the flavor of the burger which I equate more to a smokey turkey burger than a beef burger (Not that we need to equate it to “real” meat, but just to give the carnivores out there a point of reference). This was one mean burger when served with lettuce, tomato, caramelized onions, and condiments. Quorn’s vegan burgers will serve as a good substitute for classic burgers while I try to transition my boys’ into the world of homemade bean and grain-based burgers. Quorn products have been a constant in my freezer as I try to wean by husband and son off of animal products. While most of their products are not vegan (i.e. their chik’n patties have whey protein concentrate and buttermilk powder), they have been very helpful in my boys’ attempts to not eat as much meat. 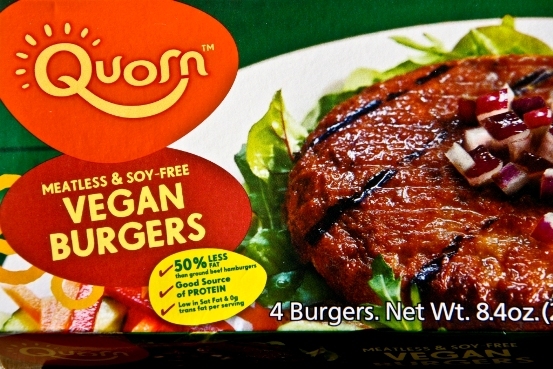 I would love for Quorn to come-up with a vegan burger that is also gluten-free. 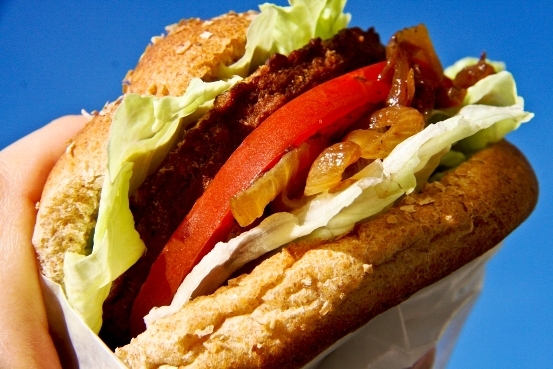 While the majority of their vegan burger is mycoprotein (mushroom), the next ingredient after water is textured wheat protein and that is a no no for those who are gluten-intolerant. Let’s hope they rise to the challenge. Who knows? Maybe they are working on it as I type! Thanks for the review, I will have to try some next time I see them at the store. I thought I heard somewhere that they are going to start making their chicken patties vegan too. I haven’t bought any of the faux meats, I just don’t want to spend the money if I could be disappointed. I may give these a try. I’m sure my son would love them. I have had some luck making bean/grain burgers. Awesome! I had been hearing the hype for months now and only just found them in a local store at last. I haven’t yet taken the plunge, but now I will definitely try them. Thanks for the review! Mycoprotein is NOT mushroom. It is a fungus. Please do your due diligence before reporting this. It is implied on the package, which is deceptive advertising. Thank you for the information. Aren’t mushrooms fungus? These are not vegan if they have cholesterol.